Why is it that President Barack Obama is so reluctant to use the "T" word? When the Fort Hood shooting took place with a radicalized Muslim extremist screaming "Allahu Akbar" and we soon found out Major Hasan had ties to radical Islamic groups, the Obama Administration chose to refer to the mass murder as "Workplace Violence." If you were on the ground at Fort Hood, I promise you they knew it was a terrorist attack. Then, last month, after a US Ambassador was killed in an obvious terrorist attack, our President persists for two weeks in calling the attack an angry protest about a film nobody has watched. The Foundation for Defense of Democracies asked the question today in a report titled, "Should the Fort Hood Attack be Classified as an Act of Terrorism?" In this article, writer Daveed Gartenstein-Ross said, "The coverage of this issue has been a bit confused, because there are actually three different questions embedded within it, and media coverage has conflated them. The three questions are: 1) should the attack be classified as “an international terrorist attack” for the purposes of satisfying Purple Heart criteria?, 2) should terrorism-related charges have been brought against Hasan?, and 3) was the Pentagon’s Fort Hood review too narrowly focused on the incident as “workplace violence” rather than ideologically-motivated terrorism?" To explore this further, I am reposting with permission, an article from Cafe Con Leche Republicans founder Bob Quasius. 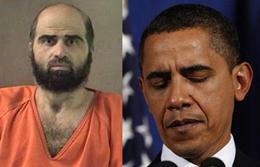 Quasius looks deeply into the Fort Hood massacre and the President's reluctance to call it was it was - Terrorism. In November, 2009, Army Major Nidal Hasan killed 13 people and wounded another 29 others, shouting ”Allahu Akbar” (Arabic for “God is Great”) as he massacred his fellow soldiers in cold blood at Fort Hood, Texas, as they prepared to deploy overseas. Major Hassan had been in constant contact with Al Qaeda leader Anwar al-Awlaki for years, and U.S. Intelligence agencies had been reading their e-mails back and forth, yet failed to act to protect our soldiers even when it became evident Major Hassan might be planning acts of terrorism. Incredibly, the Obama administration insists on labeling this obvious act of domestic terrorism as “workplace violence” and refuses to honor the fallen and wounded soldiers with purple heart medals! Soldiers who are wounded or killed in battle are almost always honored with a purple heart, if not a higher medal for valor. Besides, the battlefield is the “workplace” for soldiers, so are we now going to consider their injuries and deaths acts of “workplace violence”? What idiocy! This hard hitting video was produced by the survivors of the Fort Hood domestic terror attack and surviving family members of those who were killed, and does a great job of exposing the refusal to face reality by the Obama administration, which seems to think if they pretend terrorism doesn’t exist then it doesn’t exist! Also, apparently designating the massacre as domestic terrorism underlines an epic intelligence failure that happened mostly on Obama’s watch, and Obama would rather not admit that an act of domestic terrorism happened on his watch. Lately the Obama administration acts as if the threat of terrorism from Al Qaeda ended when Osama Bin Laden was killed, as evidenced by the weeks of delay in acknowledging the terror attack on our consulate in Benghazi was an act of terrorism. Incredibly, although the Obama administration knew for certain within hours the Benghazi attack was terrorism, and yet for weeks has sought to mislead the public with bogus claims the attack was a demonstration that spiraled out of control, as if protesters bring rocket-propelled grenades, mortars, and other heavy weapons to demonstrations! Pretending terrorism doesn’t exist anymore doesn’t make terrorism go away! The only issue I have with the video is that radical Islam is not put into perspective. The vast majority of Muslims are peace loving individuals who often feel their religion is unjustly blamed for causing terrorism, and even among Muslims who have become radicalized the large majority do not engage in terrorism. STRATFOR recently estimated that Al Qaeda has a core of 3-400 terrorists at most(not including loosely affiliated groups), infinitesmal as compared to 1.4 billion Muslims worldwide. Ask most Muslims and they’ll tell you good Muslims don’t engage in acts of terrorism, even if they are offended by a stupid video. Gallup defines radicalized Muslims as those who approve of attacks on civilians and hold unfavorable views of the U.S. 7% of Muslims are radicalized, while 93% are moderates. Muslims are no more likely to approve of attacks on civilians than Americans in general. Radicalized Muslims are no more religious than moderates, and tend to have higher levels of education and personal income than moderate Muslims. The fact radicalized Muslims are no more religious underlines their radicalization is due to politics, not religion. Also, most radicalized Muslims support democratic values, but view the U.S. unfavorably for support of brutal dictators while speaking of democracy (i.e. democracy hypocrisy), and they dislike our foreign policy (as do many moderate Muslims). In supporting democratic values, it’s unlikely that merely being radicalized leads a radicalized Muslim to commit acts of terrorism. However, there are 1.4 billion Muslims in the world, and even a fraction of a percent of that 7% radicalized Muslims adds up to a significant terrorism threat that is ignored at our own peril. When comparing how former President George W. Bush and President Obama speak of the problem, it becomes apparent that Bush always kept violent jihadists in perspective. Bush was always certain to make clear we are at war with terrorists seeking to hijack Islam to justify their evil and very un-Islamic deeds, and that America has no problem with the vast majority of Muslims who desire peace as we do. Obama, on the other hand, acts as if terrorism doesn’t exist unless we acknowledge it exists, and is quick to ‘blame America first’ when problems arise, which is political correctness run amuck. For example, there is widespread evidence Al Qaeda and affiliated groups organized the attack in Benghazi and demonstrations at other embassies and consulates throughout the Muslim world, but for weeks Obama persisted in blaming a video trailer of a third rate movie that hardly anyone ever saw, and which had been posted on YouTube months before 9/11. At the U.N. Obama repeatedly blamed and apologized for the video, though our government had absolutely nothing to do with producing, and the very act of publicizing and apologizing suggests the U.S. is at fault, fitting the ‘blame America first’ narrative liberals are so fond of. The vast majority of Muslims are justifiably very offended by the YouTube video, but don’t go out and commit acts of violence in response! From listening to Obama, you’d think everyday Muslims were so outraged that spontaneous demonstrations resulted which included violence.